...because I got this note from my cousin Eleanore yesterday (hope it's ok to publish this Ellie). 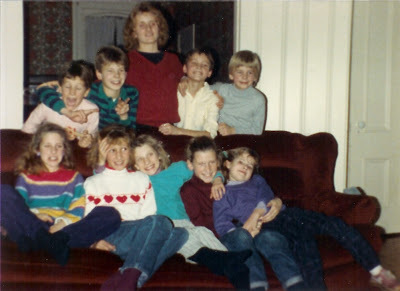 But its kinda cool that we all (the cousins) share the same feelings as adults - looking back to our beginnings ~ growing up in a small town in northern Maine with the best family anyone could be born into. I hope someday my children (once I get some!) will look back like we do, and think these same things about their childhood... That is one of the biggest hopes I have for my children, but I'm afraid since we don't live down the street from the Romanellis, up the street from the Andersons, and a few blocks away from both sets of Grandparents...it may be a little more difficult. I often wonder how I would/will make it through when one of my parents passes on. All four of you kids are remarkable from the way you dealt with your dad being sick, to all of the wonderful memories you have created with the video from the funeral. 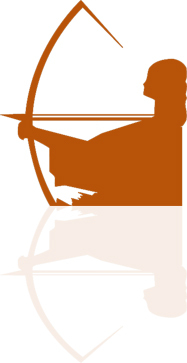 Your child, all of uncle stephen's grandchildren are going to know him. They will have wonderful memories of the grandfather they never met but they will know him. Thank goodness for all of those "stupid" "auntie carlene's memories" (videos), that camera was always in our face! ALWAYS. i hated it, but now, being older, I see why those little memories are so very important to capture along the way. ok, i HAVE to actually work while I am AT work. So many memories and we are so lucky to have a family like we have. These are my best memories, just the other day I was rolling in laughter telling some stories about us as kids, of course they looked at me like i was insane - I AM. Ellie is in the middle & Jamieson is going to have a little baby the same time as me, this July! 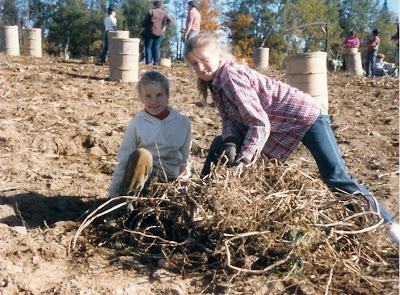 Ellie and Me picking potatoes in the Fall of 1987. And I'm lucky because I have a Mom - Astrid, a Dad who was Stephen, two brothers - David and Frank, a sister - Genevieve, and bunch of first-cousins, uncles and aunties that were more like an extension of our nuclear family, and enough good memories to last a few lifetimes.... that's not even mentioning the family I married into - Jeffrey Lee and the Moores!...and that's another whole blessing.